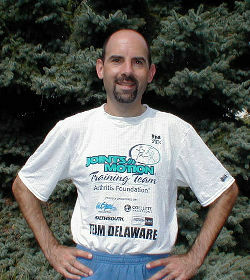 Ray Christensen, a resident of Wilmington, DE, started running in 2002 at the age of 40. Prior to that, he had only jogged 1 or 2 miles a few times each year. Enticed by a newspaper article explaining Arthritis Foundation's "Joints In Motion" program to prepare for a marathon, he began training for the Dublin Marathon. Upon achieving his goal of a sub-4 hour time, running soon became a major part of his life. Group runs and teammates made running fun, so Ray again participated the following year. During this time, he learned that the local running club was gathering novice runners for weekly training runs to prepare for the Philadelphia Distance Run, a large half-marathon. He began running with them on a regular basis and hasn't stopped since. Ray Christensen, a.k.a. "Marathon Man"
Ray dreamed of qualifying for Boston someday, so running with experienced and dedicated runners brought him more confidence and more enjoyment. The growing group soon became known as the Rebel Runners and was now coordinating weekday short runs and weekend long runs. Members trained for different events, including Ray's marathons in Alaska and New York City. 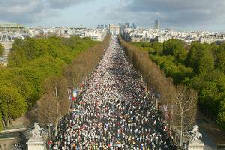 Eventually, the idea of a group trip took shape and 14 Rebels took a memorable trip to France for the 2004 Paris Marathon. Ray ran a 3hr 31min race and qualified for Boston later that year in Chicago. Due to the time and dedication necessary to accomplish a goal such as that, it was much more bearable as part of a group than making lonely runs in difficult conditions. The Rebel Runners are a very special group and Ray decided to write this book to help other people experience the support, motivation and fun that you can have while keeping fit and achieving your goals!